New owl beads have just flown in from Preciosa and I couldn’t wait to make something with them! 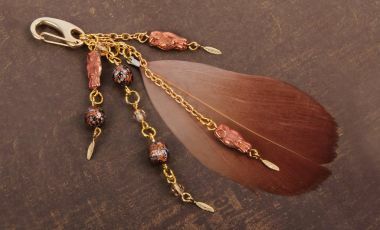 I’ve used a mix of fire-polished Czech glass beads in bronze and topaz tones with feather charms to make a pretty bag charm. The multiple chains give the piece lots of movement and the life-like feather brings the tawny owl theme altogether. Since you’ll have lots of materials left over from this project, you can easily make lots more for your friends or to sell at upcoming craft fairs. Just remember to buy a couple more clasps and charms! Begin by threading an 8mm bead onto an eyepin and use your pliers to make a loop at the end. Do this for two more 8mm beads, 3 of the 4mm beads and 3 of the owls. Cut a length of 6cm of chain and attach an owl to the end with a jumpring. Open the bottom loop of the owl and connect a mini feather charm to it. Repeat step 2 with a 3cm piece of chain. Connect another owl bead to a jumpring, attach another jumpring on the bottom loop of the owl and connect it to an 8mm bead. Open the bottom loop and connect a mini feather charm onto it. For your fourth stand, attach your 4mm looped bead to a jumpring. Then alternate between 8mm bead and 4mm bead so that you have 4x4mm beads and 2x 8mm beads. Open the end loop and attach your last mini feather charm. Use a 2 cm piece of chain or five jumprings attached together to the top of the beige feather charm. First link the short owl piece of chain onto the bottom loop of the carabiner and then the longest beaded chain. Allow the two pieces to fall next to each other and loop the jumpring of your 3rd chain through both of the top two jumprings you just added. Do the same for the opposite side with your last piece of chain.